Intended feature. 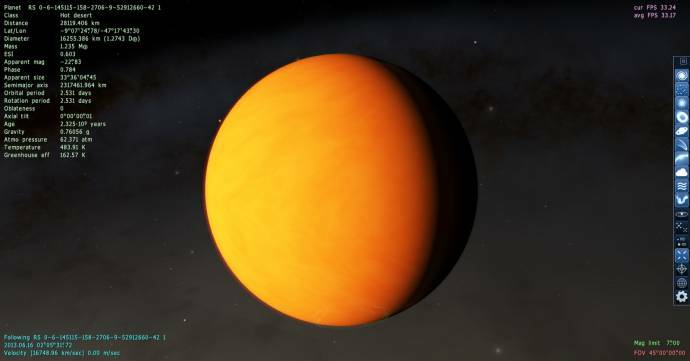 When looking at a sun/planet in real life, the light would cause the camera to lower the exposure so the planet/star doesn't look washed out, thus as a consequence making stars too dim to see. It's similar to walking inside a building after being outside on a sunny day. Notice how dim everything looks for a couple minutes? Also why the Moon Landing photos have no stars in the background. You can also test looking up at the night sky, and hold a flash light and let the light hit your eyes. Not many stars can be seen. Also, there were a few times while I was hunting around for the challenge that SE froze up and became unresponsive and the only way I could shut it down was to end proccess, could I have messed something up? I didn't seem to have that problem with the challenge galaxy though. Did you use Star browser before? I fixed the cause of great slow-down then using SB in the dense parts of the galaxy (ie star clusters). Yeah, that was while I had been using the star browser in that challenge galaxy. However, the galaxy in this case was a large elliptical (100kp I think) and I was still pretty much on the outskirts. I was using a search of 100 parsecs and in the later stages of my search, the SB varied between 300-500 or something like that. Although for the two cases where the system unexpecedly dissapeared, I did use the star browser before the first one but not the second. Since this isn't an 'asking for help' post, I guess I could post this crash report here. While going around open clusters pretty close to the core of this galaxy (between 5k and 2800 parsecs), I had noticed that sometimes while in clusters, I would get a massive FPS drop from my normal FPS of around 30-40 (sometimes 20s) to averaging 1-3 FPS. It seemed sort of random, almost every other cluster or two. I didn't check the distance of every cluster from the core, so I don't know if that is a factor. 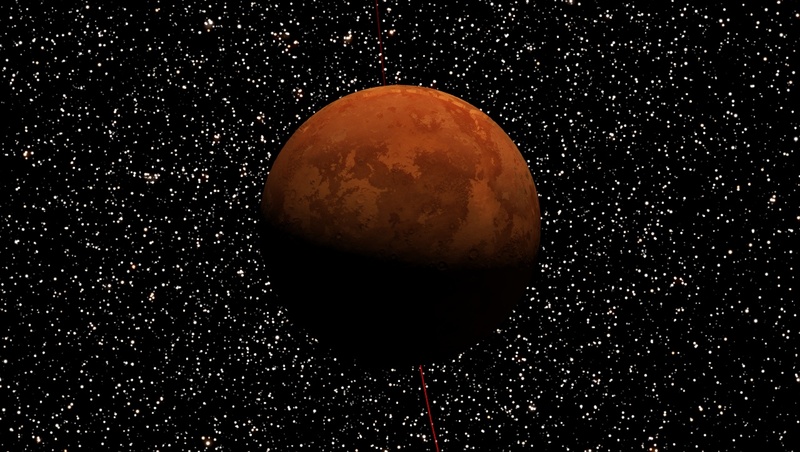 When I had gone to what might have been the closest (2,800 parsec from core), I was having the heavy lagspike as usual and was trying to ride it out as it just sort of spontaneously goes away, so I was looking around trying to find a good triple star system when SE crashed from the lag. However, when I started SE back up, the FPS was fine. Oh yeah, I'm seeing the object not found in the journey log from some systems I visited. So, there's something going on with clusters. 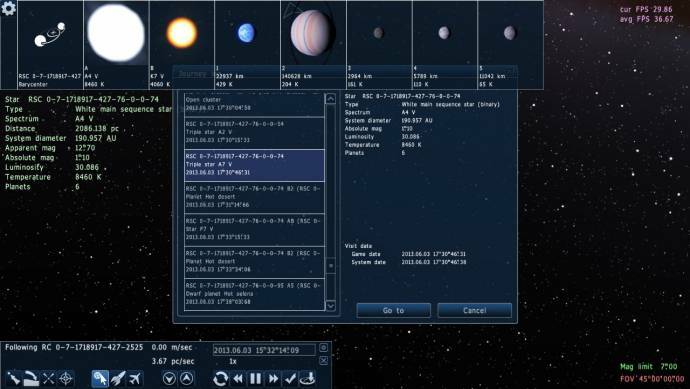 There's also something interesting, the journey log coordinate boxes (that you select) for the selected star system with planets that dissapeared and the system above it both say that they are triple systems, yet the infobox says a different star luminosity and they're binary. One thing I'm noticing is that while systems outside star clusters are fine, stars inside clusters are screwed up (at least most of the ones I visit anyway). I did some testing by clearing out the cache to see what would happen, the star I have in the example changed, then I went to a distant cluster, restarted and the star system had changed again. 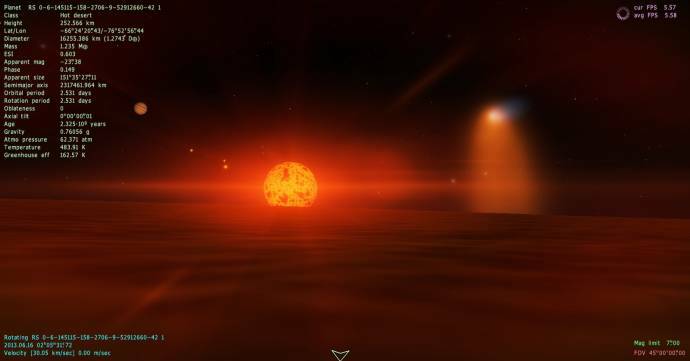 I went to that particular star (now a white giant), restarted and it didn't change. Then I went some way distance away (was double checking on stars outside clusters) and somehow it seems to have locked into that and didn't change even though I restarted. The other triple system in the log in the screenshot also seems to have settled as a single A2 V star. Since it's already messed up for me, could someone check that star coordinate and see what is there, for SCIENCE! To summarize, there is something screwy going on with star clusters, and I have the loader mode on interleaved. 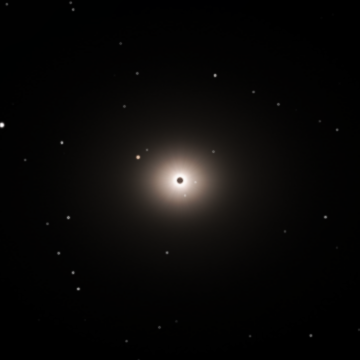 Edit: Just adding an observation note that Globular clusters are unaffected. 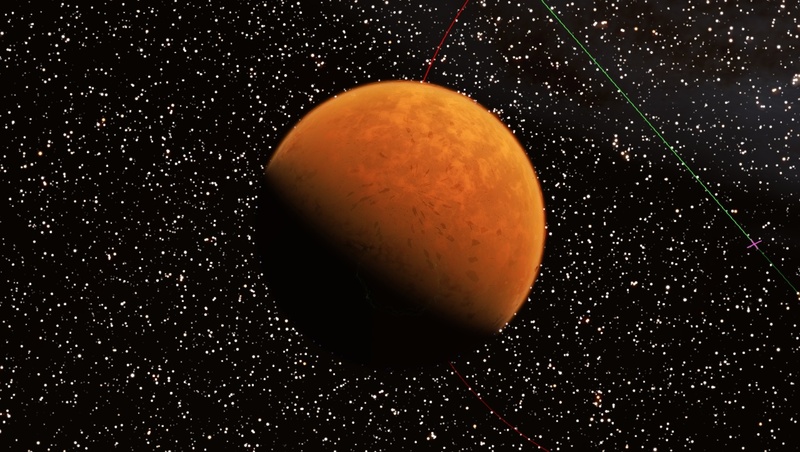 When I had gone to what might have been the closest (2,800 parsec from core), I was having the heavy lagspike as usual and was trying to ride it out as it just sort of spontaneously goes away, so I was looking around trying to find a good triple star system when SE crashed from the lag. However, when I started SE back up, the FPS was fine. Again, did you use the Star browser before? Low FPS probably caused by 20 planetary systems, rendered at once. This is a seed changing bug. 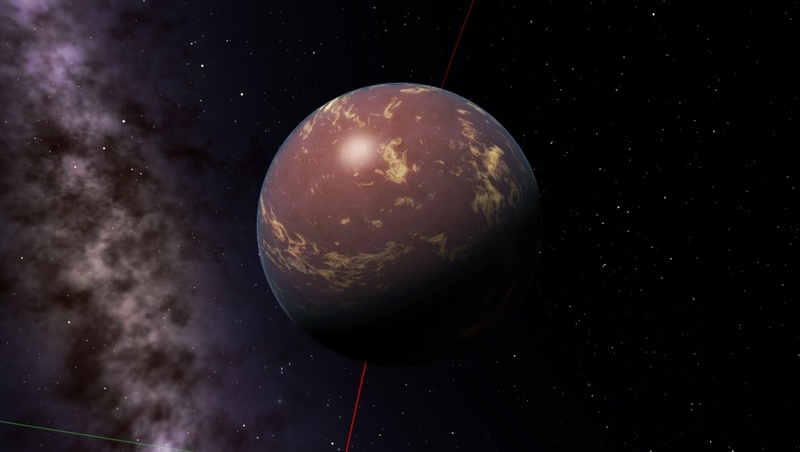 First time you visit that star, it being generated with wrong seed in some reason. When you restart SE, the seed for that star becomes right. Nope, hadn't even used the star browser in that galaxy. I did suspect it was caused by loading stars in dense clusters since it went away after a while, however, I was also getting those memory errors in the log, which is mainly why I decided to post it before I discovered this other problem. Strange, It changed multiple times for two stars before it settled (and one of them I didn't actually visit again) and it seems to only affect stars in clusters (haven't looked into globular clusters). I actually had the same problem in a different galaxy, so it's not just one galaxy. I hope that gets fixed because it's annoying when trying to find a system that I like only to have it dissapear if I crash or close the program or simply come back to find it not there. That transparent rimmed crater that I posted earlier was strange as well and could have been related to the seed changing bug. If I run into that again (assuming it doesn't vanish due to seed changing bug), I'll definetly post it. Anyone have any idea what could be causing this and how to fix it? As for what causes it, I don't know the specifics of it and all I really know is that it's a graphical glitch with the skybox that has been around for a long time. Also, you could have posted this in the troubleshooting thread rather than make a new one. 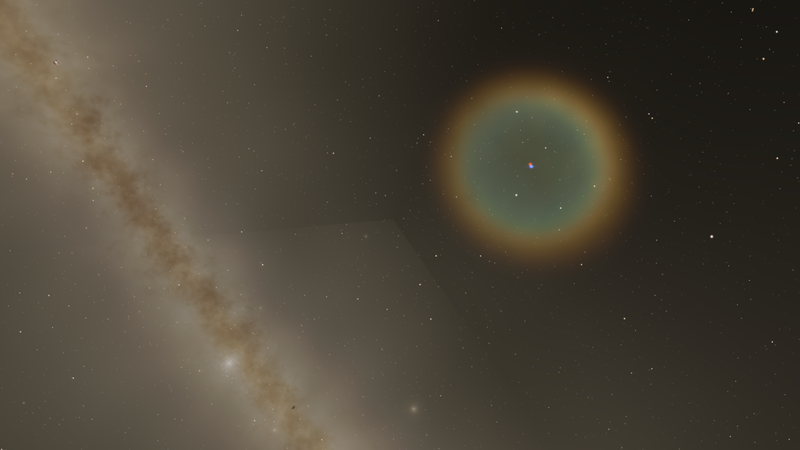 Hmuda, seams in the skybox on bright parts of the galaxy is a long-known issue, and there's no way to fix it at present. 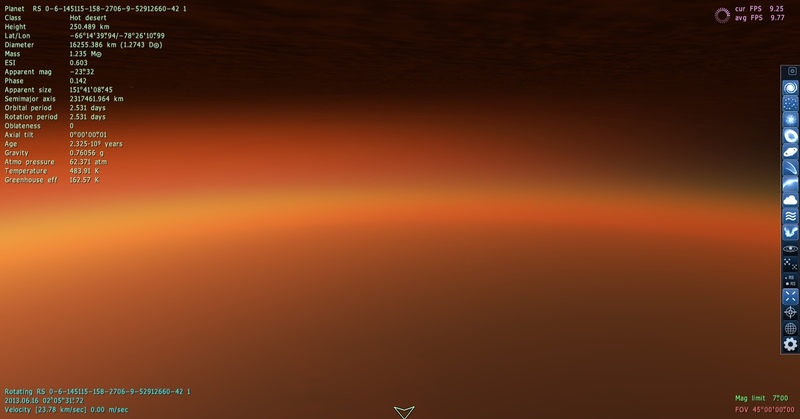 If it bothers you then you can toggle skyboxes on and off in the graphics menu (via the sidebar buttons or Ctrl-F4). Also you should have posted this in the bug reports thread. 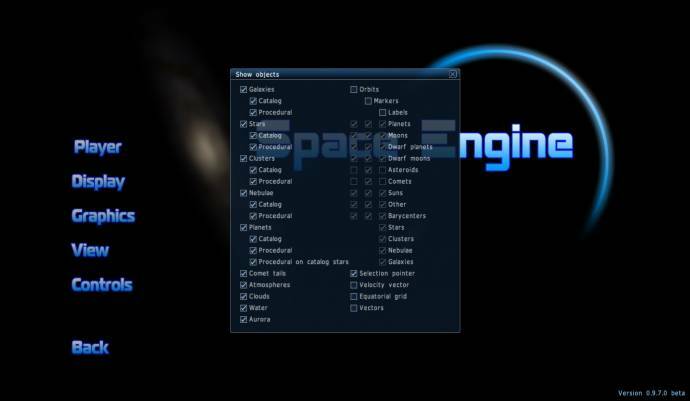 Changing the camera angle will have no effect as the skybox is only regenerated after moving a large distance. The clouds on this world are out of the atmosphere. I thought I had fixed it once by doing that, maybe not. Changing the camera angle and/or position to hide it or put it offscreen is still an option. I've run into two graphics errors in the same system which seem to be different types, the other planets in the system are unaffected. I didn't see any errors in the SE log, but I've included it to provide graphics related information. The first one resembles the shimmering that happens with an eclipse, but I checked and it's not an eclipse. and if you turn the atmosphere off, the effect goes away. Although if you turn the atmosphere off and pan the camera around slightly while looking at the same spot, you can see little flashes of light. Also turned comet tails off and both glitches still persist. This one I don't think I've seen before and unlike the previous, it shows up with atmosphere off. This is the second planet of the binary pair at the location. It's a globular cluster btw, so I know it didn't dissapear on me. I have a problem with galaxies. 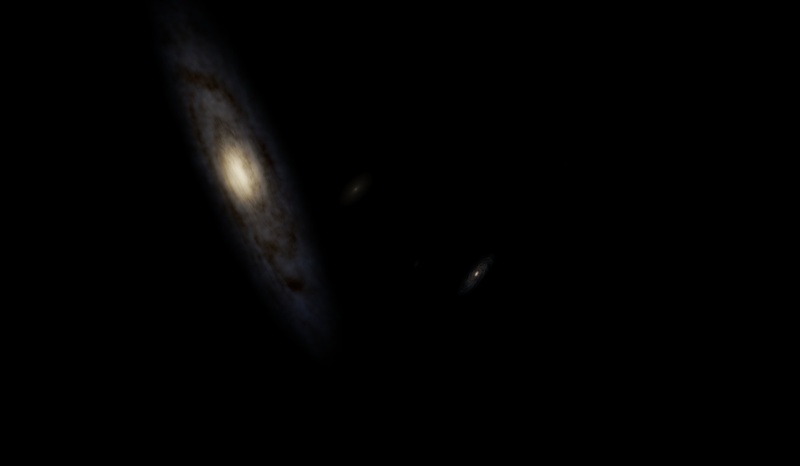 Some galaxies (both catalog and procedural) render, but a huge number of both types do not. it is impossible to select them with the mouse or see them. The search function will lead you to where they are supposed to be, but there is nothing there- not even stars. The galaxies shown are Andromeda and the Milky Way. The search function will lead you to where they are supposed to be, but there is nothing there- not even stars. Which galaxies exactly did not render? Yes, I notice that clouds are sometimes too high on 0.97. Then I noticed the screenshot havn't worked, so I can only describe what I saw : a white streal in the sky. It seemed to be big. Other bug I saw, I was going to Jupiter with the Discovery One ship, then one side of Jupiter was suddenly covered by the texture of the keyboard of the computer of the ship. When I saw this, I checked several oceanias, including one that just happened to be slightly bigger in diameter (was much more massive though), and this 3D water problem seems to be only happening with this particular planet. Edit: Spotted another one that is somewhat larger and has the same problem. Anybody remember whether this bug happened in 0.96? I don't remember if it did or not.